The Alzheimers Journey Coordinator Certificate Program will train people to become the “missing link” to help those affected by Alzheimer’s. Alzheimers Journey Coordinators will work alongside individuals experiencing dementia and care teams to both navigate the healthcare system and maximize the resources available. The need is urgent. In New Jersey, 170,000 older adults are living with Alzheimer’s. And they’re searching for solutions. The Alzheimer’s Journey Coordinator Program is a unique, first-of-its-kind initiative developed to provide students with practical skills. The program includes four courses taught over a six-month period, and it includes a 90-hour externship that places students directly into healthcare settings in the local community. When enrolled, students will be required to accommodate a full-time schedule. 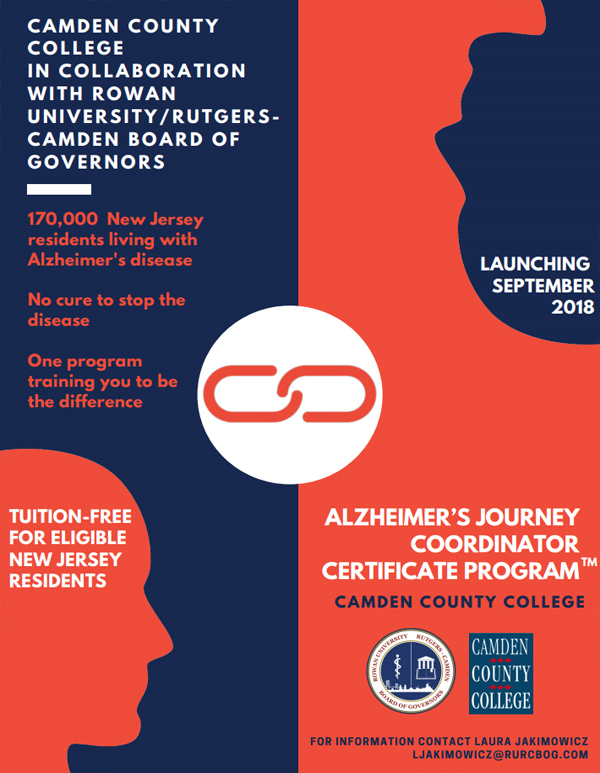 The program will place students in healthcare institutions in New Jersey as Alzheimer’s Journey Coordinators. If you are interested in advancing your career as an Alzheimer’s Journey Coordinator, apply today. The Alzheimer’s crisis is upon us. Are you ready to be the solution?